Emails will not stop rolling in just because the desk is vacant. So when art director Gustav Egerstedt went on paternity leave, Saatchi & Saatchi Stockholm sold his out of office autoreply to production company B-Reel. Those who email Gustav are primarily people who work in advertising and advertising students seeking jobs. This means that Gustav’s out of office autoreply is a good advertising channel for such production companies such as B-Reel. The advertising agency is now developing a beta service at www.outofofficead.com, where anyone can sell their out-of-office replies to the highest bidder, or donate a few lines to charity. 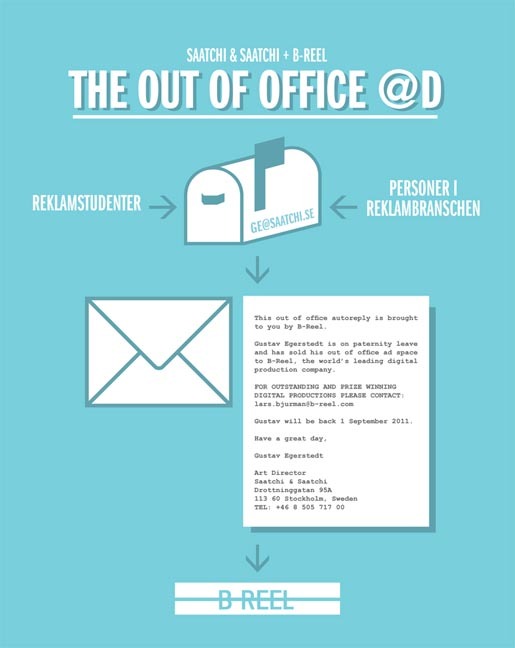 The Out of Office Sale campaign was developed at Saatchi & Saatchi Stockholm by copywriter Petter Dixelius, art director Gustav Egerstedt, assistant art director Maria Wester, and web designer Erik Hiort af Ornäs.